The Honda CB350 was a four-cylinder four-stroke 348cc road bike based on the larger fours. Thought of as Hondas "one-up" to the other Motorcycle companies. It was only produced from 1972-74, it was replaced by the larger and sportier 400 four the following year. Although Honda had a 350 Twin that was more powerful, lighter, cheaper, and faster. The four-cylinder version was much smoother running and stylish and remains one of the smallest and most sophisticated mass produced four-cylinder designs. Internal frictional losses sapped a lot of the power. The 350F and 400F models have since gained a cult following in the Motorcycle community. The Honda CB350F0 Four was sold in 1972-73. Two colors were available: Candy Bacchus Olive and Flake Matador Red. The fuel tank stripes were white and orange. The "350 Four" side cover emblem was red and white. The exhaust system was a 4-into-4 (two pipes and mufflers on each side of the bike). The engine was a 347cc 4-stroke inline four cylinder with 4 carburetors. The transmission was a 5-speed. The serial number began CB350F-1000001. The CB350F1 was sold in 1974 in one color: Glory Blue Black Metallic. The gas tank stripes were gold. The "350 FOUR" side cover emblem was white and orange. The exhaust system was a 4-into-4 (two pipes and mufflers on each side of the bike). The engine was a 347cc 4-stroke inline four cylinder with 4 carburetors. The transmission was a 5-speed. 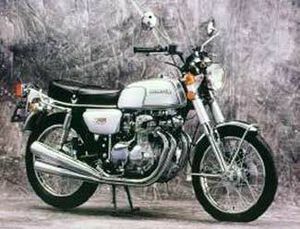 The serial number began CB350F-2000001. This page was last edited on 26 November 2010, at 21:15.